ONLY 13 MADE! The Graham Fishing Shirt combines the polish of a dress shirt with sporting details inspired by our time spent in Virginia's many waterways, crafted by hand at our Workshop in Richmond, Virginia. Constructed from an end-on-end poplin and features two chest pockets, a functioning back vent with a mesh under-layer to keep you cool in the outdoors, and a cord loop to attach your favorite fishing lure and clip-on accessories. Check out Details & Care to see what makes this fabric unique. Fabric: End-on-End Fine Poplin with added easy-iron, antibacterial, and moisture wicking finishes (no harmful chemicals). 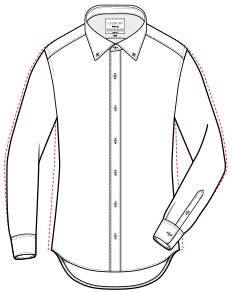 Collar: Drewes Collar - similar to our Ledbury Spread collar in terms of size and width, unlined without collar stays. Fit: Available in classic and slim fit, sizes S-XXL. Slim fit is undarted. Anti-Bacterial: Silver-infused fabric mitigates odor and bacteria, keeping you fresh from sunrise to sunset. Cooling Properties: Poplin treated with moisture-wicking technology keeps you cool under the collar - even when nothing's biting. Easy Care Technology: Creates the easy iron effect of a "wash-and-wear" but without the harmful chemicals, so you'll keep our waterways clean. Care: Machine or hand wash in cold water. Hang or lay flat to dry, as machine drying can cause shrinkage.